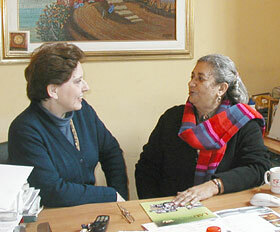 Magda Abu-Fadil talks with Mona El Sabban at Sabban's office in Cairo, December 2002. What began as a dream for cinematographer Dr. Mona El Sabban, soon became a reality when she established the Arab Film TV School on the Internet and began teaching would-be actors, directors, editors, sound engineers, set designers, producers and animators the art and craft of film-making online. “When I began thinking about setting up an Internet site to teach film and TV arts, I never thought it would see light of day in such a distinguished manner,” said Al Sabban, adding that she was grateful to the Egyptian Ministry of Culture’s Cultural Development Fund for contributing to the school’s creation. The website, launched in May 2002, is aimed at Arabic speakers and offers a detailed how-to course, with graphics and useful links, in cinema and TV production. It features a bibliography of all materials published on cinema in the Arab world since 1923. The instruction is free of charge and the school is open around the clock, seven days a week. 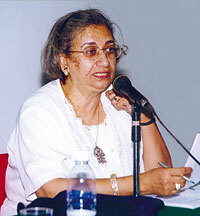 She first discussed her idea in a paper she presented at a conference organized by IPJ with the Arab-U.S. Association for Communication Educators at LAU in 1999. IPJ and the Arab Film TV School are exploring possible joint projects in the near future.